More than 40 million Americans will go camping this year, and 15 million of those will head out in an RV. So, to help you prepare for the open road, we recommend the following steps to make sure your next Colorado RV adventure is safe, fun, and worry-free. Remember what Benjamin Franklin said about RV camping, “By failing to prepare, you are preparing to fail.” Well, maybe he wasn’t talking about RV camping, but it is good advice nonetheless! Give your RV a good exterior wash with car soap and water before setting out for the season. This not only will have it looking its best, but it will also help you to identify any leaks. Inspect all the seals and sealants for cracks or leaks at least twice a year. Use a self-leveling sealant for the roof and a premium liquid silicone for small repairs, but make sure to consult your RV owner’s manual for compatibility information. Worn or torn window and door seals will also need replacing. Thoroughly inspect your tires for any cracks, wear, or dry rot between the treads, the sidewalls, and repair or replace as needed. Make sure to know the recommended pressure for your RV tires by checking your owner’s manual and inflating them to the proper PSI levels, including the spare. Also, tighten the lug nuts to torque on each wheel. Make sure to check the tire bearings for grease leaks as well. Turn off all appliances and disconnect the shore power before inspecting your RV batteries. Inspect for any damage or cracks, clean the terminals, check the connections, and spray with an anticorrosion lubricant as needed. Fully charge the battery, refill low fluid levels with distilled water, and reconnect. Then do a full inspection around the RV to make sure the brake, turn, and running lights are working properly when hooked up to the towing vehicle. Check the wires and hoses for any rodent damage and test for any leaks by opening the valves and using a gas leak detector spray or soapy water mixture and look for bubbles. You can also check your propane tank levels by placing the tanks on the ground and pouring hot tap water down the outside. Touch the side of the tank for where it feels cold to guesstimate how much propane is inside. Drain, sanitize, and flush antifreeze from your water system as needed, depending on how long your RV has been sitting. Switch your water heater bypass valve to the normal position. Leave one hot and one cold faucet open while running water through your city water connections. Check the pipes, lines, and plugs for any leaks. Once the water is flowing properly, turn off the faucets, and fill the fresh water tanks. Reopen the faucets until the water flows properly, then close the faucets, and turn the fresh water pump on. If the pump cycles on again within 30 minutes, you have a pressure drop or leak. Clean all of your LP appliances inside and out and blow out any spider webs or debris around the connectors. Turn on your LP gas leak detector, turn on the appliances, and let them run for a bit to make sure they are working properly for a few days. This gives you time to repair or replace any problems you may find before you leave town. Inspect the valve seals on your empty waste tank by working the handle in and out and making sure it opens and closes properly. Check the condition of your sewer drain hoses and replace annually. Also, make sure to use a high-quality toilet treatment solution that is safe for use in RV septic tanks and effectively breaks down waste and controls odors. Follow your owner’s manual steps to make sure your generator is working properly. Check the oil level, clean the air filter, and inspect the exhaust system for any damage before starting it up. If it is in good working order, run the generator for a couple of hours at half rated loads. Gasoline only has a sitting shelf life of 30 days, so it is a good idea to do this once a month when not in use. Replace the batteries in your smoke and carbon monoxide detectors, and check the levels of your fire extinguishers. Refill the items in your first aid kit to treat minor injuries. Also, make sure to refill your emergency repair kits with all the things you might need for minor RV repairs. While this is not a complete list of everything you need to do before going on your next Colorado RV adventure, it covers the major issues that can ruin a vacation if not checked before you leave. 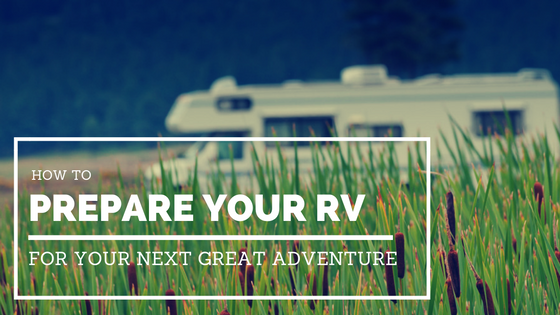 Make sure to visit The Great Outdoors RV Service Center for all the parts and services you may need to keep you rolling safely for many adventures to come!